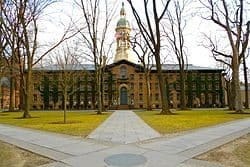 Princeton University students and employees received a reverse 911 call from school officials tonight just after 7:55 p.m. informing them that police were responding to a report of gunshots at Nassau Hall. The 911 message reported that there were no injuries. The University warned people to stay away from the Nassau Hall area. Police cordoned off Nassau Hall and set up a close-in perimeter around the building. University public safety officers were positioned at a wider perimeter. Mercer County Sheriff officers were also at the scene. As of 9:30 p.m., neither a University spokesman nor the Princeton Police were able to confirm officially that the gunshot report is a false alarm. “The incident is not confirmed at this time, and the building is currently being searched,” a statement by Princeton Police read. At 10:30 p.m., University officials said all was clear. Princeton Police searched the building and did not find anything. Yeah, shortly have seeing your initial report on FB – I noticed the helicopter, which keeps circling – and flying directly over my house on Hawthorne, by the Choir College. Thanks Kristal – I heard all the helicopters and came to PP to see what’s up. You are the BEST for up to date info.